A win is a win, no matter how many points you score. And the Sherwood High School girls basketball team got to celebrate a playoff win. The Lady Bowmen, after leading just 4-0 after one quarter of play, and holding a 6-2 advantage at halftime, came away with a 22-20 win over Forest Grove in a Class 6A state playoff first-round game played Tuesday at Forest Grove High School. With the victory, Sherwood, the No. 4 team out of the Three Rivers League and the No. 19 team in the final OSAA power rankings, improved to 13-12 on the season. The Lady Bowmen also advance to the second round of the state playoffs. They'll travel to Beaverton on Friday for a 7 p.m. postseason contest. Forest Grove, the No. 2 team out of the Greater Valley Conference, and the No. 14 team in the power rankings, finished its season with a final record of 18-7. Senior Lauren Scarvie and junior Aubrie Emmons scored eight points apiece for Sherwood win the victory. Junior post Kaytlin Cooke added three points. Sherwood and Beaverton met already this season, with the Beavers scoring a 44-32 win in a season-opening game played Dec. 1 at Beaverton High School. The winner of Friday's game at Beaverton advances to play in the Class 6A state tournament, which starts March 7 at the University of Portland's Chiles Center. 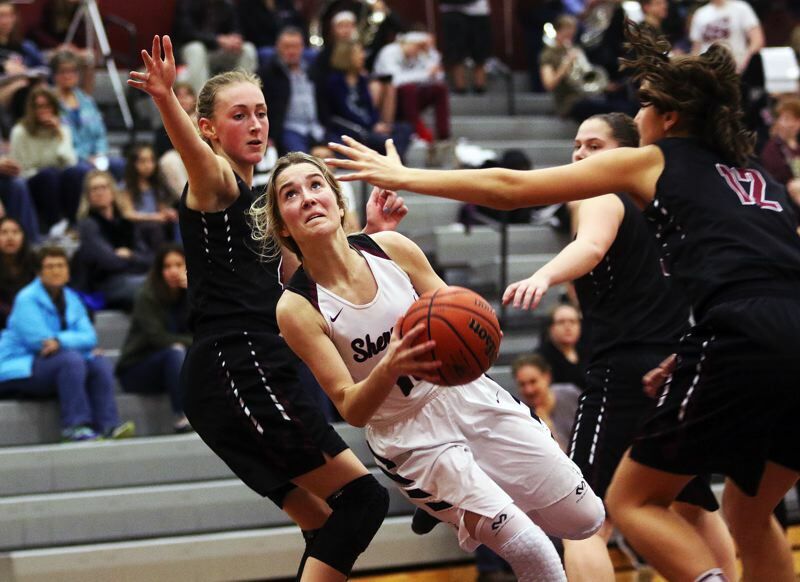 Tualatin, on Tuesday, saw its season come to a close with a 58-45 loss to Sheldon in a state playoff first-round game played at Sheldon High School. Junior Natali Denning scored 21 points for Tualatin in the contest. The Timberwolves finished their season with a final overall mark of 11-14. Sheldon improved to 20-5 and advances to host St. Mary's Academy in a state playoff second-round game on Friday. Before their state playoff games, the Lady Bowmen and Wolves met in a Three Rivers League finale played last Thursday at Tualatin High School. Denning led the Wolves with 16 points in that game. Senior Mikah Springer added eight. Junior Erin Carillo paced Sherwood with 10 points.